A while back I sent out a quick update email with some info on installing email collection forms on client websites. What I heard back was a pretty strong distaste for the pop-up opt-in. I totally get it– they’re annoying and in-your-face, get in the way of surfing, and feel intrusive. 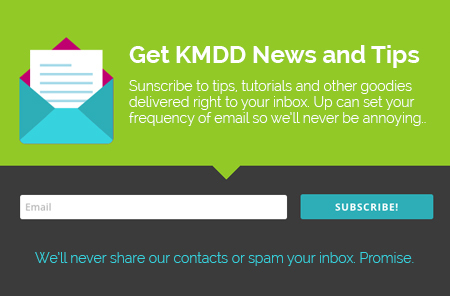 However MailChimp (KMDD email marketing software of choice) has something to say about rethinking the evil pop-up. Turns out- they work! Read about it- How to Make Popup Forms that Work. Plus, there are so many more choices these days. Trendy, non-annoying, effective choices. If you’re interested- checkout KMDD prices for getting one of your own.